His Holiness the Dalai Lama began his North American programme with a visit to the White House for his long awaited meeting with President Barack Obama. On his arrival at the White House, His Holiness was received by Ambassador Capricia Marshall, the Chief of Protocol of the United States Government and was led to the Map Room. His Holiness was accompanied by Special Envoy Lodi Gyari, Representative Lobsang Nyandak Zayul and Secretary Tenzin N. Taklha. President Obama was accompanied to the meeting by Presidential Advisor Valerie Jarrett and Senior Asia Director Jeff Bader. His Holiness and the President met from around 11:20 till around 12:30 pm. In a statement the White House Press Secretary said "the President commended the Dalai Lama's "Middle Way" approach, his commitment to nonviolence and his pursuit of dialogue with the Chinese government." His Holiness gave a brief remark to the White House press during which he expanded on what he had discussed with the President. His Holiness said he felt honoured meeting the President of the greatest democratic country. Since childhood, His Holiness said he had admired America, not as a military power, but as a champion of human value and human creativity. His Holiness told the media that he had apprised President Obama about his three commitments of promoting human values, promoting religious harmony, and resolving the Tibetan issue. I commented that females were biologically more sensitive to others' pain and suffering and the President agreed with this. I said I wished that more female should take leadership role. On the second commitment, he suggested that while keeping to one's own religion people should respect others' religious tradition. On the third commitment on the issue of Tibet, His Holiness said that since 2001 there is an elected leader who takes the lead. He jokingly said that usually he introduced the elected leader as his boss, while spiritually he was the boss of the elected leader. 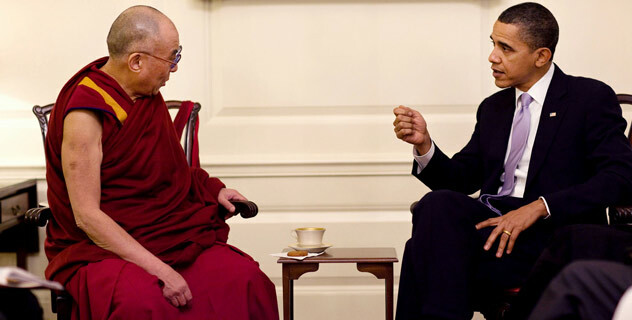 His Holiness said the President himself inquired about the issue of Tibet. His Holiness reiterated his full commitment to the Middle Way Approach. He said he thanked the President for his interest. Even before his elections, he showed his concern, His Holiness said. After his election, the President continued this concern, including during his visit to Beijing last year, he added. In the afternoon, on his way to the State Department to meet Secretary Hillary Clinton, His Holiness stopped briefly outside the hotel while a crowd of Tibetans had gathered to greet him. Majority of them had come down from New York to participate in the welcome events that the Tibetan communities in the Washington, D.C. Area and New York had planned at the White House today. These Tibetans showed strong emotion as His Holiness appeared before them and bursts into sobs and prayers for His Holiness' long life. At the State Department, Secretary of State Hillary Clinton was joined in the meeting by Maria Otero, Under Secretary of State and Special Coordinator for Tibetan Issues; Kurt Campbell, Assistant Secretary of State for East Asia and Pacific; and David Shear, Deputy Assistant Secretary. On his return from the State Department His Holiness addressed the media gathered outside the hotel and took some questions from them. His Holiness talked about President Obama's support of his approach. When asked how the Administration would implement this, His Holiness said time will tell saying nobody can predict. When asked what kind of reaction he expected from China to today's meeting, His Holiness said he felt almost certain that there would be some negative reaction, some criticism, some scolding. His Holiness said he wanted to tell the Chinese leadership, to look at every issue in a more holistic view. He said they can then get fuller knowledge about the reality. By looking at any problem from just one side, His Holiness said one can't see the reality fully thus making one's approach unrealistic. He said it was in this context that some Chinese policy looks very childish to some people. When asked whether he felt frustrated to come back here year after year with so little changing in Tibet, His Holiness said he did not feel so. He added that the important thing is that we have the truth, basic right and reasonable right. He said therefore it was worthwhile to make an attempt adding that it did not matter whether we realise this goal within one's own lifetime or not. He said the issue is something worthwhile, something that benefits not only Tibetans, but also in whole Asia, and, particularly, millions of young Chinese. He said 50 years have passed and we never gave up our hope. When asked whether they had talked about US-China relations, His Holiness said they did and recalled his basic position on how the world should engage with China. His Holiness said during the time when discussions where going on in the United States as to whether China should be given the Most Favored Nation status, he had supported it. His Holiness said while the world should engage in economic development relations with China, there was also the responsibility to bring China into mainstream of world democracy. His Holiness said the hardliners in the Chinese leadership perceive the term democracy to be negative and argue that Western style of democracy may not fit Asia. His Holiness said that India and Japan very successfully practice democracy. His Holiness said China's ultimate ambition is to become superpower and added that in order to become superpower, moral authority is a very important condition. He said superpower in the sense of military force, like that of the former Soviet Union, brought more fear, more distrust, and more discomfort. On the other hand, a superpower like the United States, which is an open society, democratic, independent judiciary, brings more, sort of, trust, more comfort. His Holiness said China eventually should be such a superpower, which brings happiness, satisfaction, and calm. His Holiness said transparency and free media were essential in this. His Holiness said that whenever he met with some Chinese friends, Chinese professors, and scholars, he talked about the need for China to be an open society. Then, trust can develop, he said. His Holiness also talked about the need for genuine friendship between India and China, the two most populated nations. He said that genuine friendship only comes on the basis of mutual trust. His Holiness said he had also discussed with the President about development in the American society. He said President Lincoln had abolished slavery while Martin Luther King Jr. fought for civil rights. He said it was now great that a non-white has become the President of the United States. His Holiness recalled hearing the news of President Obama's election victory while he was attending a meeting of Gandhians in the Indian city of Pune. His Holiness said everyone clapped which indicated that Obama's elections impacted not only the United States but also the world. When asked whether India was with him on this political journey, His Holiness replied, "India is my home." Thereafter, His Holiness met with Indian Ambassador Meera Shankar, former Under Secretary of State Paula Dobriansky, Under Secretary and Special Coordinator on Tibetan Issues Maria Otero and some Tibetans. In the evening His Holiness attended a Tibetan New Year reception hosted by the Aspen Institute.